A new feature in summerhouse design! 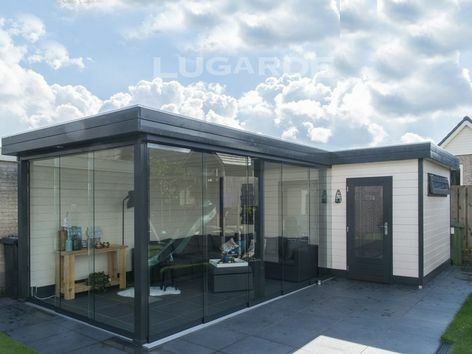 The Prima Sofia features the fabulous versatile sliding glass walls meaning you can enjoy your summerhouse in any weather. Overall size is 7.8m x 4.8m. The summerhouse measures 3m x 4.8m in 44mm log thickness and the canopy with two glass walls measures 4.8m x 3m. 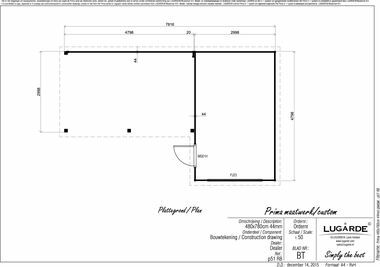 The standard package includes 1 x PE46H single door and 1 x PJ23 window. Measurements are taken to the outside faces of the walls. Please note: the Lugarde images shown are representative and may contain features which are not included in the price shown on this page. Includes one extra log level.